Grapefruit for your baby: Grapefruit is one healthy option that provides many of the vital nutrients essential for the healthy growth and development of the baby. Grapefruit comes in different varieties. Let it be white, yellow, pink, or deep red, the grapefruits have a variety of health benefits. Can You Give Grapefruit To Your Baby? Yes, you can try giving Grapefruit to your baby once he is introduced to the world of solid food. Grapefruit is highly beneficial for babies as it not only a rich source of vitamin C and Vitamin A, it also provides small amount of other vitamins and minerals that are essential for the healthy development of the baby. However, moderation is the key when it comes to feeding grapefruit to your baby. Helps with detoxifying naturally- The grapefruits that are pink in colour are loaded with antioxidants and it even helps in flushing the toxins from the body keeping the organs of the baby protected. Improves The Immune System: Vitamin C is a major component of grapefruit that helps in enhancing the immunity of the child and even protects her against all sorts of infections. Also, being rich in vitamin A grapefruit influences the production of healthy white blood cells, thereby, plays vital role the baby’s immunity. Daily consumption of grapefruits makes you less vulnerable to common cold and flu. Protects Liver: The child’s liver gets cleaned by consumption of grapefruit. It expels the toxic agents from the liver making it more healthy. Enhances Eyesight And Cell Division: A quarter cup of sliced fresh grapefruit has 26.5 micrograms of vitamin A. Vitamin A is essential for healthy eyesight. Vitamin A also promotes cell division, which is essential for your baby’s growth and development. Enhances Respiratory Health: Presence of vitamin C is responsible for boosting the complete respiratory health of a child. 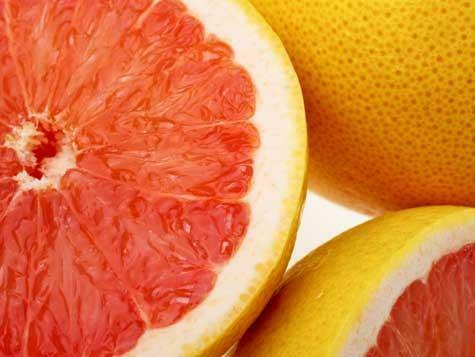 Grapefruit is also used to cure asthma or bronchitis, breathlessness etc. Boosts hair growth: Intake of grapefruit also promotes healthy hair growth. It even removes the bacteria present in the hair follicles or scalp which could lead to hair fall. It promotes the blood circulation in the scalp and offers it adequate nourishment. How Can I Give Grapefruit To My Baby? Take three or four slices of grapefruit. Peel the skin off. Blend it with little water and some sugar. Sugar will help to balance out the acidic content of the fruit. You can pour it into a sipper and let the baby drink. NOTE: One should be cautious that not more than two slices of this fruit are given at the start. Also never give it more than a couple of time per week. This fruit has high acidic levels and is juicy as well, so the intake should be a moderate one. Giving too much grapefruit to your baby can pave the way for several intestinal issues as he grows up. There are a plethora of benefits by the consumption of grapefruits, yet there are some precautions and considerations that must be kept in mind while feeding them to babies regularly. It is important to take the doctor’s advice before starting this fruit as it has high fiber and acidic properties. In case of any allergies in the familydue to consumption of citrus fruits, it is best not to give it to the baby as it might have unfavourable effects. In case any signs are seen like rashes, pain in the abdomen or stomach upset, its consumption should be stopped at once. Try offering the fruit in a juice, puree or mashed form when starting, making it easier for the child to digest. One should have a moderate consumption of the fruit as the excess of it could create intestinal disorders in the future. Ask the doctor about the needed quantity to be given regularly. Always cut into small pieces before giving to prevent choking hazards. In order to minimise the acidic effect of the grapefruit, it is advisable to add sugar or honey. How To Select And Store Grapefruit? Select the Grapefruits that is firm, yet should feel soft to some extent when a gentle pressure is applied. Skin marks are quite common in grapefruits. However, these exterior of a grapefruit do not always affect the taste. Yet, overly rough or wrinkled skinned grapefruits should be avoided. Avoid the grape fruit that shows indication of decay. A markedly soft spot in the fruit indicates decay. Keep grapefruit in room temperature and use them within a week. Thus, we know that while grapefruit is a yummy fruit which is enriched with minerals and vitamins and has umpteen number of benefits that assist in the healthy growth and development of the baby yet one needs to be really cautious while having it regularly. Overall a super food for the babyand be it white, pink or even red colour, it is a mix of risks as well as benefits and is a class apart than other fruits.